Benjamin Hawkins has served the United States in a variety of positions. Born in what was then Granville, and now Warren County, N.C., August 15, 1754. Hawkins was educated in the county schools and later attended the College of New Jersey (now Princeton University). 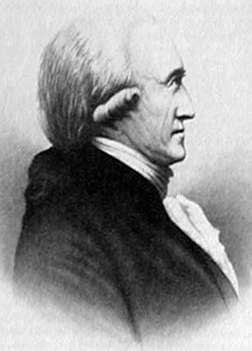 When classes were suspended due to the revolutionary war, Hawkins was selected by George Washington to serve on his staff as interpreter. 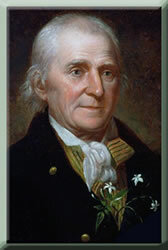 Benjamin Hawkins served as aide-de-camp to Governor Abner Nash of North Carolina. He was a member of the Continental Congress 1781-1783 and 1787; elected to the United States Senate and served from December 8, 1789, to March 3, 1795. 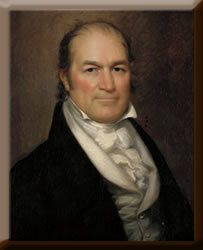 He was appointed by Congress to negotiate treaties with the Creek and Cherokee Indians in 1785, appointed Indian agent for all the tribes south of the Ohio River by President Washington in 1796 and held the office until his death in Crawford County, Ga., on June 6, 1818. Crawford County was created from Houston County in 1822. It was named for United States Secretary of War and Treasury William Harris Crawford. Before 1822, the area was inhabited by the Muskogee people, called Creeks by the Europeans. Knoxville was designated the county seat of Crawford County in 1823. It was named for Henry Knox, Revolutionary War hero, and Secretary of War from 1785 to 1794. 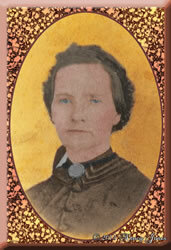 Joanna Troutman lived in Knoxville when she made a flag for Georgia troops leaving to join in the fight for Texas independence. That flag was first flown at Velasco Jan. 8, 1836, was hoisted along with the Bloody Arm flag at Goliad on news of the declaration of independence March 8, 1836, and was one of the inspirations for the Texas Lone Star Flag. Dr. John Stith Pemberton was born January 8, 1831 in Knoxville, Crawford County, Georgia and died August 16, 1888 in Atlanta, Georgia. He is the son of James Clifford Pemberton, born 1803 in North Carolina, and Martha L. Gant, born 1791 in Virginia.It is unknown when his family moved to Rome, Georgia. By the time he was 19, he had graduated from the Georgia College of Herbal Medicine in Macon, Georgia. He later moved to Columbus, Georgia and set up shop as a Druggist. He served as a Colonel in the Confederate Army and was wounded in the battle of Columbus. He was given morphine for the pain of his wound and became addicted. He moved to Atlanta in 1870 and was a well known and respected chemist. His expertise was in medical chemistry rather than regular medicine. He was considered a skilled practical pharamacist and chemist. 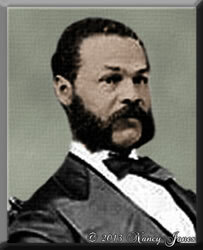 He is best known as the inventor of the formula for Coca Cola,which is said to have occured May 8, 1886 in Atlanta. He is buried in Linwood Cemetery, Columbus, Georgia. Jefferson Franklin Long was born a slave in Crawford County Georgia, March 3, 1836. He became a merchant tailor in Macon, Georgia. Long was the first African-American from Georgia elected to the United States House of Representatives. Long was elected to the Forty-first Congress to fill the vacancy caused when Samuel F. Gove was declared not entitled to the seat. He served from January 16, 1871 to March 3, 1871, and was not a candidate for renomination. Long did serve as a delegate to the Republican National Convention in 1880. 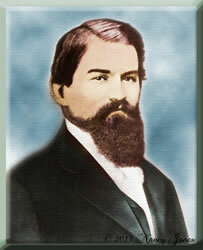 He resumed business in Macon, Georgia, and died there on February 4, 1901. He was interred in Lynwod Cemetery , Macon, Georgia. Travelers through present day Roberta might never guess that at one time it was a thriving tourist town with several motels, restaurants and gas stations. US Hwy 341 was the main north-south thoroughfare through the state, and US 80 took travelers to Texas and beyond. With the construction of the Interstate Highway system, towns along the older routes were left behind.